Grand Challenges Canada is dedicated to supporting Bold Ideas with Big Impact® in global health. They are funded by the Government of Canada and they fund innovators in low- and middle income countries and Canada. The bold ideas they support integrate science and technology, social and business innovation – they call this Integrated Innovation®. They focus on bringing successful innovation to scale, catalyzing sustainability and impact. They have a determined focus on results, and saving and improving lives. 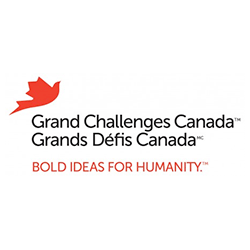 Grand Challenges Canada works closely with Canada’s International Development Research Centre (IDRC), the Canadian Institutes of Health Research (CIHR) and the Department of Foreign Affairs, Trade and Development Canada (DFATD).